When you are working on a website, have you ever thought about helping a person with poor eyesight finding their way? Or maybe a person with poor hearing who could not listen to the audio track in the streaming video? These are just a few accessibility problems which can be encountered by people with disabilities. Andy Clarke is a a visual designer in the UK and author of Transcending CSS – the fine art of web design. 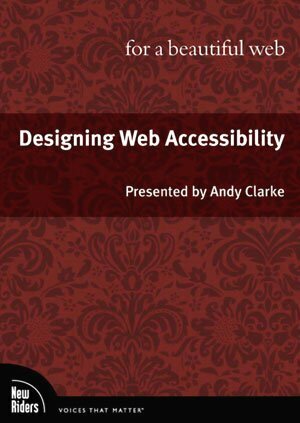 Andy just released a new DVD through Peachpit called Designing Web Accessibility for a Beautiful Web. He makes it very clear that creating the best web experience for as many people as possible includes people with disabilities. This DVD is filled with over 2-hours of thought provoking material. Most websites have barriers to accessibility problems for people with disabilities (who can not see, speak, hear, use a mouse, etc) but can access the web through special types of software. W3C published the Web Content Accessibility Guidelines 1.0 (WCAG) in May 1999. The “Bobby Approved” badges correspond to these ratings. WCAG 2.0 does recognize that even best efforts can not make some areas fully accessible and does not penalize for it. Critics have said that the 2.0 was too vague and filled with too many loopholes to be really practical. In response, a group of developers lead by Joe Clark formed the WCAG Samurai and released the WCAG Samurai Errata which expands on WCAG 1.0 and updated areas which were known to be out-of-date. Andy covers each of these topics in great depth. Some things you may already know (ex. using ALT tags to describe images) but there are many that you may not have considered (ex. providing transcripts for streaming video and audio.) There is an additional benefit to accessibility … it makes your website more accessible to search engines! The end result is better indexing and better ranking. He compares some of these techniques to “black ops” used by SEO experts. The results may be the same, but the reasoning is completely different. Still, by justifying such extra steps as ways to improve SEO, makes accessibility a WIN-WIN.